This past Sunday was such a peanut butter day for me! I started my day off with peanut butter and jelly toast for breakfast. Then for a snack I had greek yogurt with peanut butter and Jelly and then I decided to bake cookies and of course what else are they filled with? Peanut butter and jelly!! I swear I’d be sick of it, but I’m not!!! 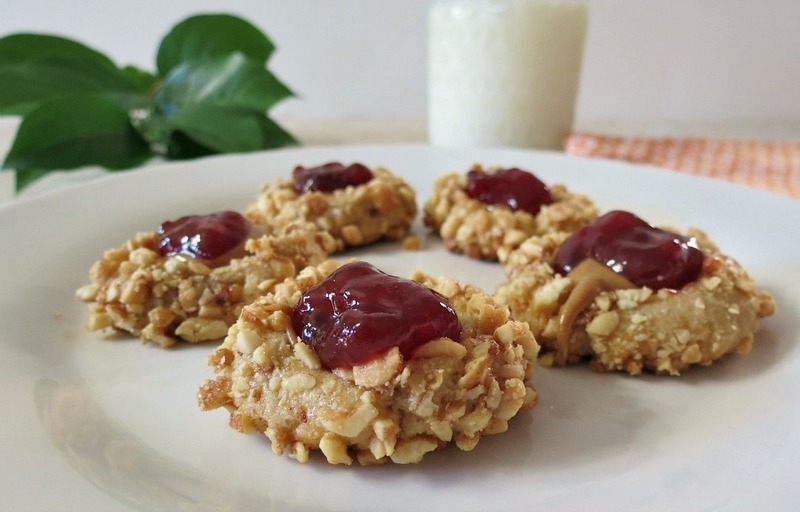 These cookies couldn’t scream peanut butter and jelly anymore. It is a perfect replica of a PB and J and I love it! 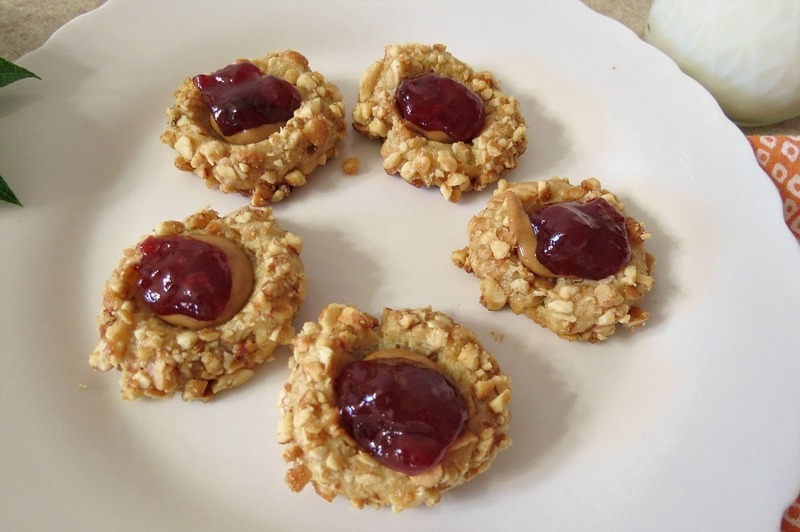 These are your traditional thumbprint cookies, and instead of baking jam in the center, I made the cookies naked! 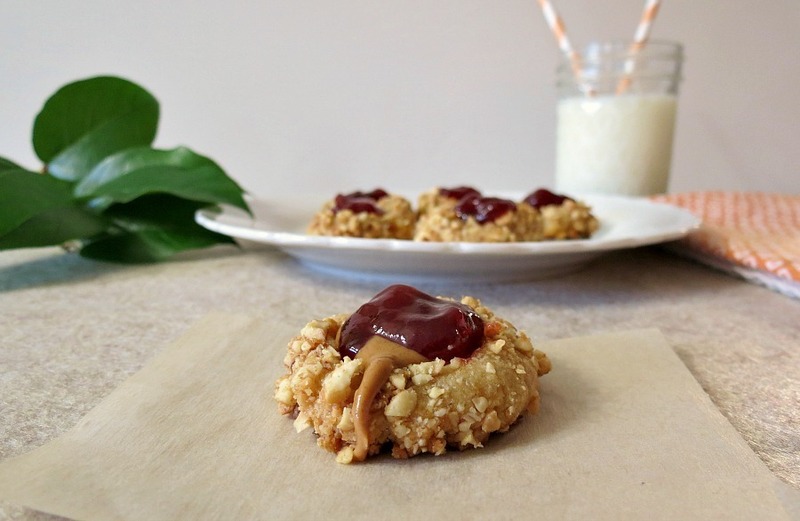 Once the cookies cooled I filled my thumbprints with some creamy natural peanut butter and topped it with my Stonewall Kitchen Sugar Plum Jam. Now of course you can use any jam you like. I think strawberry and raspberry would be perfect!! For the nuts I used Honey Roasted Peanuts. Oh man, are they good!! I am loving these cookies. I can assure you that I will be making them throughout the year, not just at Christmas time!! To make them healthier I used whole wheat pastry flour and NuNaturals Tagatose. The only thing not healthy in the recipe is I used a stick of butter, but sometimes you just need butter!! Normally I don’t care to make these kind of cookies because they are so time consuming. You know rolling them in a ball, dipping in egg white, then rolling in nuts, bake then fill. But this recipe only makes 24 cookies, so besides cooling time the whole process took about 30 minutes. Not to shabby!! Here is my favorite cookie, because he is ozzing with peanut butter! The cookie was just calling me, so I did what anyone else would do and eat it!! I know I wrote a post last week swearing off cookies, yah that lasted about 12 hours!! I have no control and I really do enjoy baking cookies! I think they are one of my favorite things to make!! There easy, fun and everyone loves them!!! The only issue is trying not to eat them all. Maybe I should start making things I wouldn’t eat? Nah, what fun would that be? Everything you see me post, I eat, unless I stated otherwise, but I eat 99.9% of everything!! They key is moderation and lots of exercise! 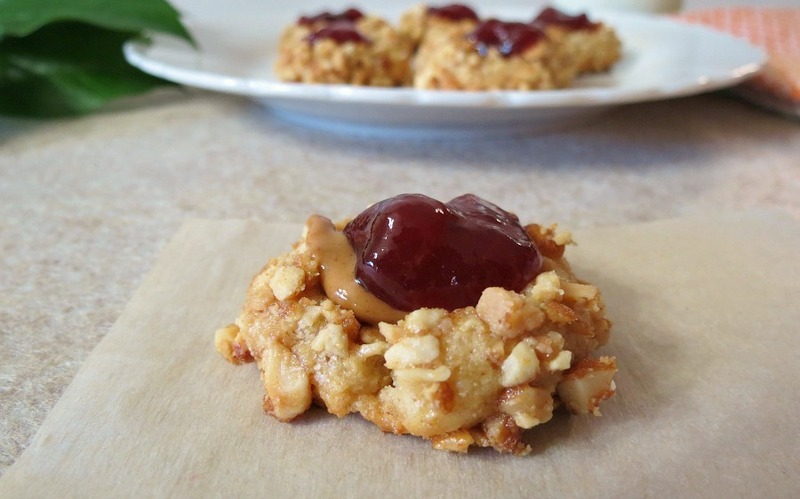 A butter base cookie rolled in honey roasted peanuts and topped with creamy peanut butter and jam. A perfect replica of a Peanut Butter and Jelly Sandwich. In a medium bowl add flour and salt, mix until combined; set a side. In a large bowl beat butter and sugar. Beat in egg yolk and vanilla extract. Add flour mixture, and beat until combined. In a small bowl, add egg whites and mix until frothy. On a plate add chopped nuts. Bake in oven for 8 - 10 minutes or until nuts are lightly brown. Place on cookie rack to cool. 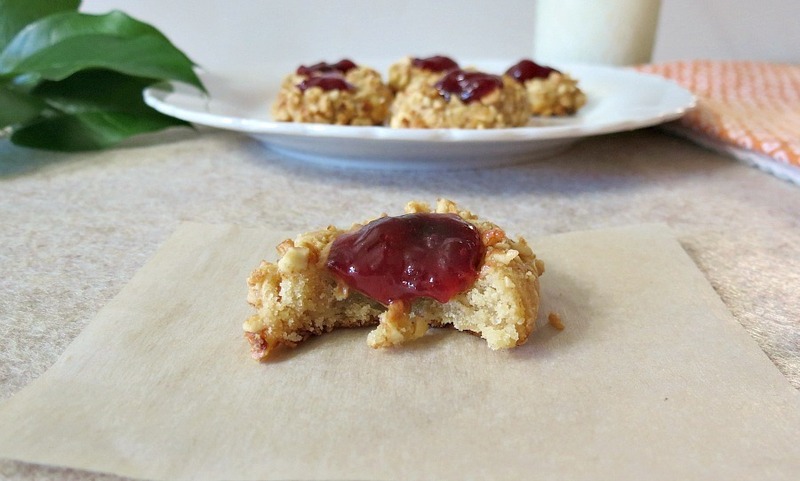 Once cool, evenly divide the peanut butter into the thumbprint, then top with jam. 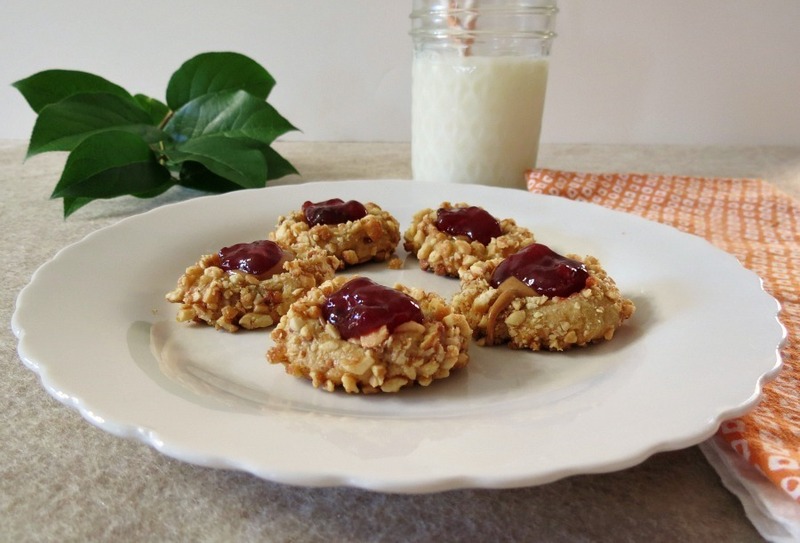 You can use the basic recipe to make any kind of thumbprints you like. 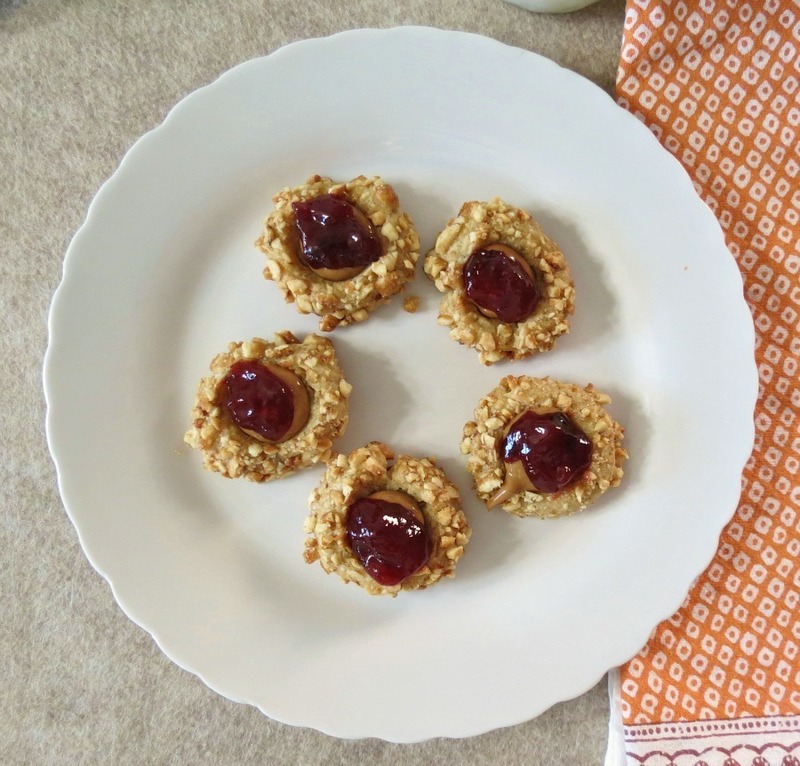 If you’re a traditional thumbprint person, just add your jam to the center, then bake them. The cooking time will be about 2 minutes longer. Or you can add whatever kind of filling, just use your imagination, the combination possibilities are endless!! Oh one last thing, I wanted to let you know I made it into Emeril’s Serious Sandwich Hall of Fame! He he You can check out the article here. YUM! Peanut butter and jelly is one of my favorite sandwiches. A cookie vaiation could only be delicious. My mother makes the best strawberry jam, I steal a jar every time i visit her, that would be perfect on these cookies 🙂 P.S. you’re Sunday sounded amazing with all that pb & j! These sound amazing! Would all purpose flour work okay? very yummy! These look fantastic! If they have pb &j… they would be good for breakfast right? Thanks for sharing on Foodie Friends Friday and remember to come back and vote on Sunday. These look wonderful. Thanks for sharing on Foodie Friends Friday. Please come back Sunday to vote.